One of the joys of parenthood is letting your pack loose outside to build an appreciation for the great outdoors. However, as with any aspect of parenting – you need to be prepared, and that means properly outfitting your little ones in the gear they need throughout their adventures. When it comes to hiking, you don’t really want your kids’ feet to hurt, do you? Well, it sounds like you need to look into buying the best hiking shoes for kids. 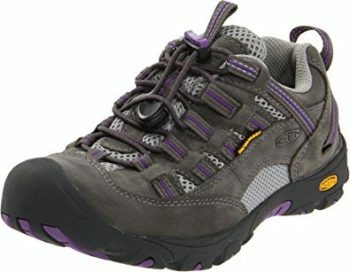 Hiking shoes are infinitely more comfortable to wear than normal shoes are on rocky trails. Often cushioned with a layer of thick EVA midsole, these shoes provide impressive arch support so your child would be able to bounce up the trails without putting any unwanted pressure on their little ankles. Hiking shoes and boots are fantastic allies to keep little feet dry, cozy, and supported all day long, but how do you find the ideal hiking footwear for kids? That’s why we are here to help! We’re going to take a comprehensive look at what makes an excellent child’s hiking boot, and examine a handful of offerings from top brands to see how they might best fit your needs… and the needs of whatever little feet will be following you on your outdoor escapades. Let’s get to it! Before we go deeper, let’s think about what you actually need to check before buying a great pair of boots. As even newbie parents know, there are always factors to consider and research to do before buying anything for your little guy or gal. These days, the market is flooded with multiple options for just about every single kid-related item you can think of, so it pays to know exactly what to look for (and what to ignore) before you buy. While we may not be able to help you select the perfect high chair out of a list of 30+ options (…good luck with that), we can help you pick the perfect hiking shoe for your kids by giving you a checklist of essential features for your reference. Fit can be tricky when it comes to kids, and that goes double for hiking boots. You want to give your child’s foot a little room to grow so that you’re not investing in a new pair every couple of months, but a boot that fits too loosely makes your little hiker more prone to injury. When trying on boots, make sure there is enough room for socks of all thickness, as well as any inserts your child might need, while ensuring that the boot fits snugly (but not too snugly!) around the footbed and ankle. Hiking boots should ideally reach up around the ankle in terms of height, but they should never stretch higher than the calf. Too-tall boots will infringe on your child’s freedom of movement and, again, increase the risk of injury. Kids are famous for taking off full-tilt no matter how slippery or dangerous the terrain, so you’ll want a boot with outstanding traction to keep them safe and upright on the trail. A flexible sole is also key – tread that can bend along with the foot will provide optimal traction on all surfaces. Kids can sometimes be unfamiliar with the feeling of heavy tread, however, so it’s a good idea to let them wear the boots in “normal” conditions (around the house, at your usual neighborhood playground) to get a sense of how the tread will feel with each step. This will cut down on the chances of injury when they take to the trail in earnest. Let’s be honest: kids have no real concept of “roughing it,” let alone “no pain, no gain.” If you put your kids in uncomfortable shoes, you’re going to hear about it…constantly. Why not do all you can to ensure both your child’s comfort and the peaceful vibe of your outdoor adventures? A few key points to keep in mind in the comfort department are ample padding of the collar, smooth, breathable lining, and substantial padding and arch support. If you choose a leather boot, it might be a good idea to add an extra coat of water-repellent wax to soften the leather and maximize flexibility, thereby speeding the “breaking in” process. If you know kids, you know that they will inevitably end up wet somehow…even on the driest of days. It may be the result of puddle-splashing or a spilled juice box or, yes, precipitation from the heavens, but you can bet the mortgage that your kid’s shoes will end up coated in some sort of liquid. Might as well ensure that the boot can withstand the punishment. If you find a pair of absolutely perfect boots that aren’t waterproof, don’t despair: they might not be constructed to be entirely water-resistant (meaning they might let in moisture if totally submerged), but at the very least you can buy a waterproofing spray to treat the leather/fabric against getting wet. Kids are notoriously hard on footwear. Those young, supple joints mean that every step is usually more of a stomp, and this can be hard on poorly constructed boots. Do your research when it comes to the company from whom you’re buying – their reputation usually speaks quite accurately to how their product holds up. A great resource when it comes to durability is the customer reviews. No one is more honest (or, in some cases, quicker to complain) than a disgruntled parent when a product doesn’t hold up as promised, so skimming the user reviews of a potential boot will give you a good idea of its real-life performance. Now that you know just what to look for when it comes to selecting a kid’s hiking boot, let’s take a closer look at the options we mentioned earlier. You might recognize some of these brands from your own footwear purchases, or you might be discovering a new favorite! 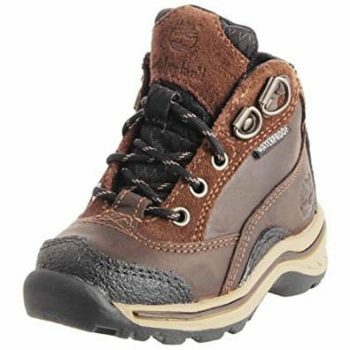 The Hi-Tec Renegade Trail WP Hiking Boot is a solid choice for your child’s first pair of “real” outdoor footwear. With all the bells and whistles of adult-sized hiking footwear, these boots will keep up with your kid in even the wettest, most rugged conditions. Comfort is a top priority with these boots: an EVA sock liner and compression-molded WV midsole are specially designed to absorb and distribute shock-even after your daughter’s thirtieth time jumping from a rocky ledge to the trail below. The thickly padded interior and collar offer optimal ankle support, along with abrasion-resistant toe bumpers and the added support of board lasted steel shanks. The breathable mesh side panels will keep little feet well-ventilated throughout the day. In terms of performance, not much can beat this boot: they are entirely waterproof and seam-sealed and sport a carbon rubber outsole for superior traction. The rust-proof brass hardware will keep these boots looking sharp long after they get passed down to little brothers and sisters. Related: Your child might complain about these shoes being stiff and uncomfortable in the break-in process. To reduce the level of discomfort felt, you can make them wear these REALTREE Merino Boot Socks. The thick and protective yet breathable material will definitely make it easier for your child to get used to their new shoes. No matter what kind of adventures you have planned for the family, you really can’t go wrong with the KEEN Alamosa WP Hiking Boot. They’re lightweight, breathable, and flexible, offering prime support without weighing little feet down. The performance of this boot is superb, but the comfort they offer is also off the charts. Padded, mid-height collars and padded tongues give cushioned support to key areas, and the nylon mesh linings in each footbed wick moisture away to keep things dry all day long. The lightweight EVA midsoles are also suited to absorb and distribute shock no matter how hard your crew hits the trail. These leather and nylon mesh boots are fully waterproof and are durable enough to last through multiple seasons of wear. KEEN’s secure-fit lacing system enables older kids to tighten their boots up with a single pull, and the cord locks are designed to keep the laces right where you want them until the trail’s end. Related: These secure shoes are perfect for children who are quite used to hiking trips and ready to challenge the next level of adventure. If your child loves outdoor activities, support that interest by also purchasing this G4Free Small Shoulder Backpack for them. They will learn how to efficiently pack things into a backpack with this. We’ve all been guilty of brand bias, but sometimes taking a risk and choosing a lesser-known brand can pay off. That’s what many users are saying about the durable-yet-affordable Nevados Cire Hiking Boot. 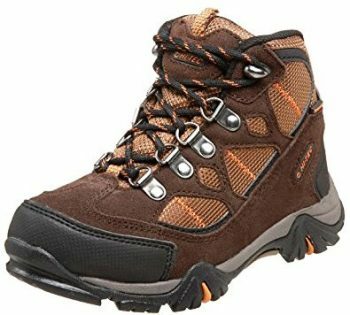 While Nevados might not be a name you recognize in outdoor footwear, this well-constructed boot has all the necessary bells and whistles to ensure comfort and stability on the trail for your junior hikers. The waterproof leather and mesh upper rivals boots that retail for 25 percent more, and—placed side by side—it would be nearly impossible to tell the Nevados from its more expensive counterparts. The padded collar and tongue of these boots will have your kiddo stepping in comfort no matter how long the trail and the cushioned EVA insole provides ideal shock absorption and distribution. The traction of this boot is just as impressive; it can handle rough terrain just as handily as rainy or slushy days. Related: High-impact adventures can be somewhat rough on your child. Their body is already overheating due to the exertion. If you add the sun’s harsh glare to that, the risk of heatstroke is one that cannot be overlooked. Simply by making them put this Sun Protective Zone Kids Safari Hat however, you can reduce that risk significantly. Timberland is a name many outdoor aficionados will recognize; reputable, dependable, and well-designed footwear is what many have come to expect from the brand, and the Timberland Pawtuckaway Hiking Boot is no exception. Timberland is one of the few brands you could buy blind and be almost entirely guaranteed your satisfaction…but why not take a closer look while you have the chance? Among the special features of these well-crafted boots are the EV footbed to provide comfort inside and the tough rubber outsole to provide excellent terrain on the outside. A mesh lining in the boot wicks away moisture to keep little feet cool and dry throughout the duration of activity. This boot also takes the guesswork out of sizing with its removable sock liner. The liner can be added or taken away depending on the fit of the boot to your child’s growing foot. This durable boot will last for multiple hand-me-down cycles among siblings or neighbors, and the sock liner can provide a customized fit no matter who is sporting these sturdy boots. Related: You’ve got your child’s feet covered with a high-quality pair of hiking shoes, but have you considered which pair of pants they should put on for their adventure? Nothing less than a waterproof pair such as this Oakiwear Kids’ Trail II Rain Pants will do. You wouldn’t want your child to catch a cold. That would be put an early end to what could’ve been an amazing journey. 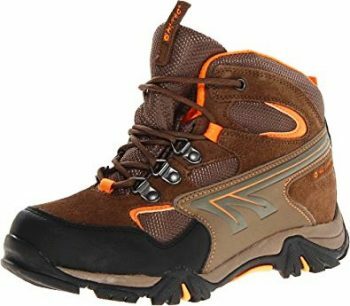 The Hi-Tec Nepal Junior Hiking Boot is a popular choice for kids who need footwear that transitions easily from the trail to the playground and back again. While it’s not the most heavy-duty boot on the market, it covers all the essential bases to make it suitable for outdoor activity. This hiking boot combines suede and performance fabric for a durable upper that is entirely waterproof and features a breathable mesh lining. The rustproof hardware ensures that the boot will still look good even after a good soaking, and the abrasion-resistant toe bumper keeps little piggies fully protected. The multi-directional traction (MDT) carbon rubber outsole allows your little one to navigate uneven surfaces with ease. Perhaps most impressive about these hiking boots is its Big-Fit insole system. The system consists of two insoles; the lower insole can be removed to extend the boot by half a size—great news for parents whose kids seem to grow an inch every time they turn around. Related: If you’re concerned that the relatively poor ankle fit of these shoes will hurt your child, don’t worry because all you have to do is slip these Footminders Pediatric Arch Supports into the shoes. This shock-absorbing pad will definitely help support your child’s ankles. 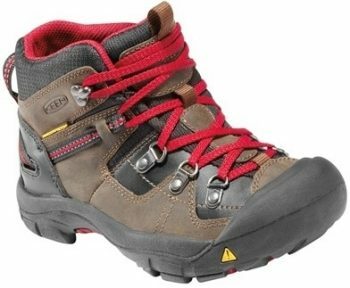 KEEN boots have an impeccable reputation when it comes to outdoor footwear, and the KEEN Clayton WP Hiking Boot brings this quality to the up-and-coming generation of hiking aficionados. You can always rest assured that the money you invest in a pair of KEENs will be well spent when it comes to what you get in return. The boots have comfort in the bag: the waterproof, breathable interior membrane keeps feet dry and comfortable no matter what the conditions might be on the trail, and the cushioned ankle provides support and keeps the cold breezes at bay. Users say the tongue of this boot always stays in place during wear, and never moves around or bunches up, causing blisters or discomfort. The most impressive feature of these boots might be its dual-climate rubber outsole, which hardens as the weather gets colder so that it can be better equipped to get a solid grip on frozen or snowy terrains. However, even in mild weather, the Clayton’s deep lugs provide ultimate traction for little hikers on the go. Related: If your child has been through enough adventures for you to consider taking them on some serious off-road trips, then perhaps it’s time to give them a pair of HABA Terra Kids Binoculars so they won’t just learn how to enjoy nature, but they would also be able to understand it better. The last thing you want to be thinking about on the trail is your footwear, that’s why it pays to think about it plenty before you make a purchase. That goes double for kids, who are always rougher on shoes and boots—even if they grow out of them in a single season. That being said, it might seem to make fiscal sense to settle for cheaper hiking boots when getting your kids trail-ready, but it only takes one cold, wet, messy hike (or one badly sprained ankle) to remind you why you should always do your homework and invest a bit of cash in your kids’ outdoor footwear. Are you a hiking parent who’s purchased hiking boots for your little ones? Have you had a good (or less-than-good) experience with any of the brands mentioned here? Do you know of any other pair of hiking shoes that will fit right into this article? Please share your thoughts with us in the comments!